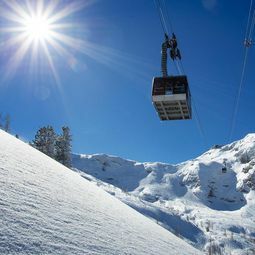 With the panorama ticket, winter hikers (snowshoes & winter boots) can uphill by Dachstein Krippenstein cable car to the top of the mountain and enjoy the charming winter landscape at a snowy hiking tour. The ticket for winter hikers and sunbathers - valid for ascent and descent by Dachstein Krippenstein cable car, all 3 selections. Our tip is quite simple – go up, make a snowshoe hiking tour or a hike on your boots or go to a lodge, be amazed at the panorama and then go back home overwhelmed and satisfied ;))). At times it is foggy in the valley the whole day long and up here the sun shines at its most resplendent, the Dachstein Krippenstein also makes a good viewing mountain. Children born 2013 and after receive a free pass when they are accompanied by an adult (‘Family ID’ required). Age is to be proven with an official form of ID.